Martin Schaffner was a German painter whose work combines late Gothic elements with other, characteristically Renaissance ones. He travelled to Augsburg where he studied the work of Hans Holbein the Elder and Hans Burgkmair as well as Dürer’s prints. Schaffner was a noted designer of medals that depicted members of the aristocracy of his native city of Ulm. He also produced altarpieces, such as the Wettenhausen Altarpiece, which is considered his masterpiece, and portraits, of which only a few have survived. The present panel depicts a man in three-quarter profile, his body outlined against the dark blue-green background that shades to a lighter tone towards the bottom. The pale flesh tones of the face are striking, as is the contrast between the background and the dark clothing. It seems that this name was assigned without any documentary basis as the mathematician Peter Appianus, hypothesis rejected in 1969 by Christian Salm. Nevertheless, according to the latest research, the painting appears to have been part of a double portrait together with that of A Lady in the Philadelphia Museum of Art. The female sitter in the painting in the American museum has been identified as Katharina Gessler (née Gienger) by the historian Jens Kremb, who believes that the subject of the Thyssen painting could be her first husband Sebastian Gessler. Martin Schaffner, an artist associated with the city of Ulm, developed a style that combined late Gothic formulas with Renaissance elements. Little is known of his early years and the date of his birth is known from an annotation by the artist on one of his drawings. In 1496 he is documented in the workshop of Jörg Stocker in Ulm, and around 1500 in Augsburg where he trained with Hans Holbein the Elder.Most of Schaffner’s oeuvre comprised altarpieces and he was significantly affected by the Reformation. Like many other artists, this situation led him to rethink his output and he subsequently placed greater emphasis on portraiture. This small panel was in the collection of Count Josef von Rechberg and is then recorded in the collection of Prince Oettingen- Wallerstein where it appears in two inventories of 1817/1818 and 1819, described as by the school of Schaffner. In 1828 it was in the castle in Nuremberg in the possession of Louis I of Bavaria. In 1911 it was in the Alte Pinakothek in Munich and in 1929 in Berlin with the Hugo Perls gallery. It was acquired that year for the Rohoncz collection. This person was identified in early catalogues of the Collection from 1930 onwards as the mathematician Peter Appianus, with a question mark after the name. It seems that this name was assigned without any documentary basis, and therefore in 1969 Christian Salm published it simply as Portrait of a Man. 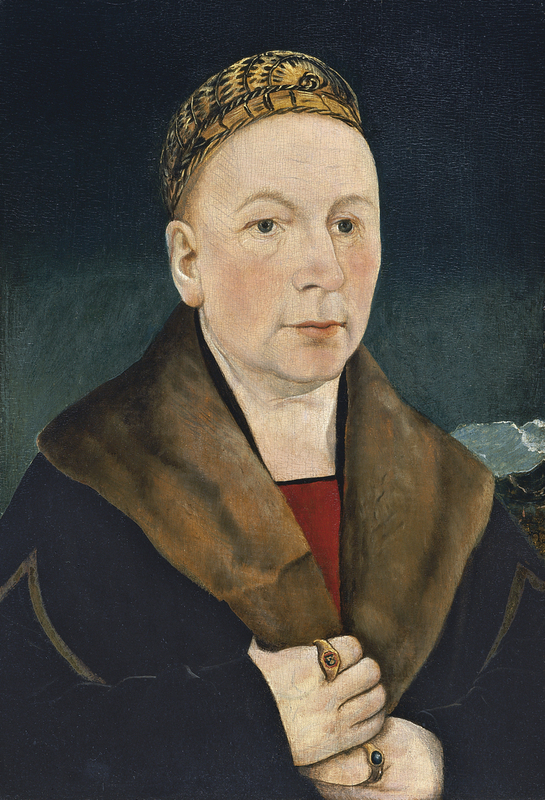 The Thyssen painting appears to be the companion piece to the Portrait of a Lady in the Philadelphia Museum of Art, whom the historian Jens Kremb has identified as Katharina Gessler (née Gienger) and, accordingly, the subject of this painting as her first husband Sebastian Gessler. The coat-of-arms in blue and white on the sitter’s right index finger remains unidentified but both his appearance and clothing suggest a member of the aristocracy or wealthy bourgeoisie. The figure is depicted in slightly more than threequarters profile against a graduated green-blue background which is almost black at the upper edge. The head is strikingly pale in tonality, allowing the artist to create a face with precisely modeled details but without an excess of detail, clearly defining the outline of the nose and the wide, thin-lipped mouth. Areas of underdrawing are evident to the naked eye in zones such as the left side of the forehead, the eye sockets and the neck. The sitter is plainly dressed apart from the broad fur collar of the coat while he wears a type of hat fashionable in the early 16th century. With regard to its date, this oil on panel has been compared to two others: Count Wolfgang I von Oettingen in the Alte Pinakothek in Munich, of 1508, which is the earliest portrait attributed to Schaffner, and another of 1516 of Eitel Besserer, a member of a patrician family in Ulm, now in the Museum in Ulm. Lübbeke considered the present work to be closer to the portrait of Besserer and to a group of panels with scenes of the Passion in the Staatsgalerie in Augsburg.